Business Insider spoke to Mars chairman Stephen Badger, the great-grandson of founder Franklin Mars, to get some insight into what the company has planned for the future. The biggest change coming to Mars in the next five years will be portfolio transformation, Badger said. Mars – the company that makes M&Ms, Snickers, Skittles, and other popular candies – has big plans to sell more than just food during the next five years. “The biggest transformation that we’re continually pondering is our portfolio transformation,” Mars chairman Stephen Badger told Business Insider. The 106-year-old company has historically been known for making some of the most popular candies in the world, and for making common household food brands like Uncle Ben’s Rice. But as Mars expands, it’s looking to not only add new products, but new services as well. One area it has been heavily been investing in is pet-care. 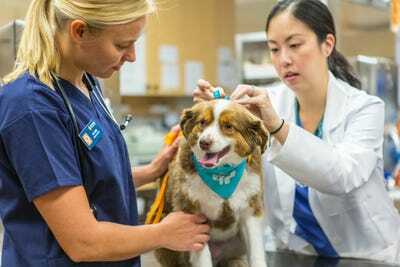 Mars bought VCA Inc, which manages some 800 veterinary hospitals in the United States and Canada, for $US9 billion last September. Mars’ pet-care portfolio already includes Blue Pearl Veterinary Partners, which it acquired in 2015; Pet Partners, which it bought in 2016; and Banfield Pet Hospitals, which it purchased in 2007. The company also makes Iams, Nutro, Pedigree, Royal Canin, and Whiskas pet food. Americans alone spent some $US70 billion on pet products and services in 2017, according to the American Pet Products Association, so it’s easy to see why Mars sees a big opportunity in the space. In fact, pet-care is now Mars’ biggest business. But the next five years won’t be all about adding new products and services. The company also has big plans to find new ways to tell consumers about its products. “It’s incumbent upon us to perpetually think about the changing nature of consumers’ behaviours, not only in terms of what they want to buy, but where they want to buy it, and how they want to be told about it,” Badger said. To do this, the company is working on a digital transformation that it hopes will better connect its products with people.